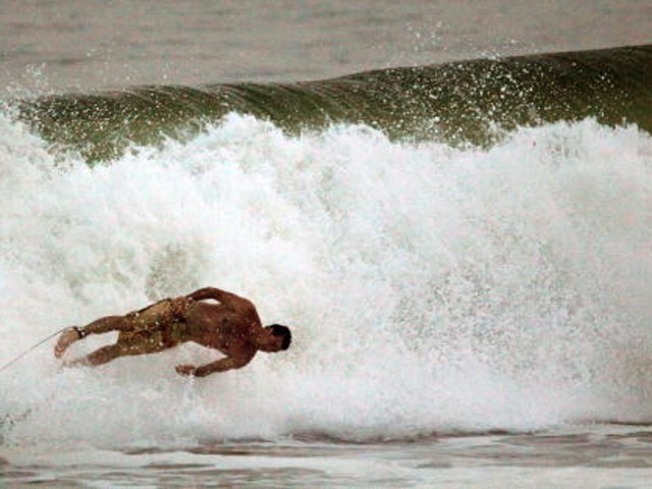 A surfer bails off his board in stong waves created by Hurricane Bill on Rockaway Beach August 22, 2009 in the Queens borough of New York City. The weakening Hurricane Bill continued northward generating high seas and closing beaches along the eastern seaboard. Tropical storm Danny isn't yet a household word on Long Island. But he has caught people's attention. As she sat in a lounge chair overlooking the Great South Bay, Jan Kaye proclaimed she has no worries about Danny. Long Island officials, however, aren't as blasé about the approaching storm but insist that they, too, can handle whatever Danny brings. “Since Katrina, we have done a soup to nuts review of our emergency preparedness and we are ready,” said Suffolk county Executive Steve Levy. Emergency preparations are underway in both Nassau and Suffolk counties. Forty-five shelters stand ready in case any evacuations are needed and everyone from Red Cross volunteers to Long Island Power Authority crews are on stand by if the storm hits Long Island. In addition, the Long Island Contractors' Association has agreed to make 1000 pieces of heavy equipment available to Suffolk county to aid with any clean-up. The American Red Cross is also urging homeowners to gather flashlights, batteries and emergency radios in case Long Island homes lose electricity in the storm. For now, Danny's wrath is expected to be worst off the coast of Long Island. Officials here are predicting only some rain and possibly high wind gusts on the mainland. Still, Nassau county's emergency preparedness commissioner said Danny remains unpredictable and will be watched closely until he passes by. Meanwhile, New England were warned Thursday to prepare for the possibility of heavy rains and flooding this weekend as Tropical Storm Danny headed north. The greatest area of concern is the area from Boston south to Providence and east, Simpson said. Forecasters expect up to 5 inches of rain in isolated areas, prompting some fears of flooding. Heavy rains, but no heavy flooding, were forecast for New Jersey, while in New York, waves could reach 12 feet and winds on the twin forks of Long Island could gust to 20 to 30 mph, the National Weather Service said. You can track Danny here, at NBCNewYork.com's storm tracker page.